China's ambitions in higher education appear limitless. 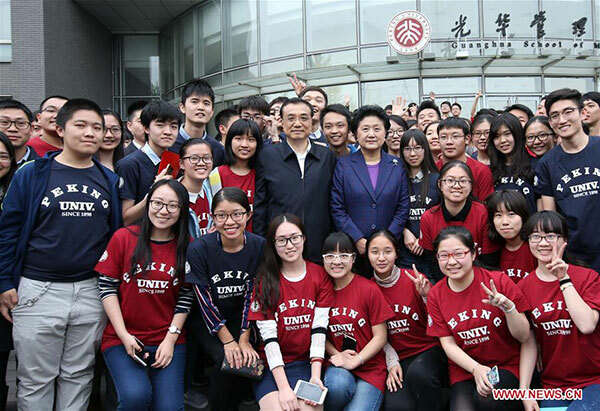 The country intends to propel 16 of its universities to "world class" status by 2030, with 10 already reaching that goal just three years from now, according to Caixin business news. In 2015, the State Council imposed that a "certain number" of universities and disciplines should become world class by 2020, eventually turning China into a leading higher education nation by 2050. And it's not just the central government that has set its sights on conquering the global higher-education landscape; 21 provincial regions have published blueprints setting ambitious goals for the development of more than 110 "high-level" regional universities in the next decade. If successful, these plans will lead to an education ecosystem that allows internationally competitive institutions to develop. Despite the official announcement on Jan. 18, there is no common definition of what a world-class university actually looks like. The most common indicators of prestige are based on a university's relative position in one or more of the three main international rankings: the Times Higher Education (THE), the Quacquarelli Symonds (QS), or the Academic Ranking of World Universities. The 2016 QS ranking include four Chinese mainland universities in its Top-100 category: Peking, Tsinghua, Fudan, and Shanghai Jiaotong universities. Peking and Tsinghua universities have consistently ranked in the Top 50 for a number of years, while their Shanghai-based counterparts are relative newcomers to the higher rankings. Three additional mainland universities are found among the Top-200 universities, the University of Science and Technology of China (USTC), Zhejiang and Nanjing universities. The picture painted by the 2016 THE ranking is largely similar. Compare this with the rankings of the traditional higher-education power houses: in the 2016 QS ranking, we find 31 U.S. and 18 U.K. universities among the Top-100 institutions, with Australia (6), Canada (4), Hong Kong (4), Singapore (2), and New Zealand (1) contributing 17 additional Top-100 institutions. The English-speaking world thus contributes a total of 66 universities to this tally, which appears disproportionate given that only about 5.5 percent of the world's population speaks English as its first language. This highlights one of many problematic assumptions underlying these rankings. They only consider academic output and citation scores based on articles published in English, mostly in excessively expensive academic journals that stretch library budgets to breaking point. The "publish or perish" mantra has never been as alive, yet this focus on the numbers of publications an individual academic produces hampers sustained intellectual pursuits and may potentially prevent discoveries that could be triggered by leaving the "safe" approaches leading to guaranteed publication. In addition, the three main rankings are inherently biased toward including achievements in science, technology, engineering, and math, which are among the most expensive disciplines to support. Indeed, to attain a world-class ranking requires wealth. Although access to funding is not necessarily an integral part of the ranking methodology, the presence of strong industrial links is valued more highly than having exceptional faculties of arts, social sciences, humanities, or education. Producing internationally competitive scientists, engineers, and multimillion-dollar patents clearly counts most. But pumping money into the system is not the only requirement to convert an average university to a world-class university. An environment defined by a high fraction of international students and faculty members certainly helps, but any changes only affect an institution's ranking by less than 10 percent. The QS and THE rankings both rely for a significant extent on the fuzzy concept of an institution's global academic reputation, in research, in teaching, or in both. These components favor the old, well-established universities through their "old boys" networks. For Chinese universities to break into these circles, a systematic focus on international collaboration and recruitment, an environment facilitating world-class research output, and implementation of measures leading to high international esteem are fundamental. A 2011 World Bank study, "The Road to Academic Excellence: The making of world class research universities," concluded that academic talent, both faculty members and students, financial resources, adequate facilities, unrestrained scientific enquiry, and academic freedom must be present from the start. Philip Altbach, director of the Center for International Higher Education at Boston College, has pointed out that excellence in research and a sense of intellectual excitement are crucial additional elements to make a sustained move up the rankings a viable proposition. He highlighted a truth that many academics are familiar with: "The world-class [rankings] debate has one important benefit: it is focusing attention on academic standards and improvement. Striving for excellence is not a bad thing, and competition may spark improvement. Yet, a sense of realism must be part of the equation, and sensitivity to the public good as well. Indeed, it might well be the case that the innovative energies and resources of higher education should be focused on more realistic and perhaps more useful goals." Ambitious plans to develop a world-class education ecosystem may clash with practical obstacles, at least for the time being.